An American cousin to German limburger, Liederkranz® has a similar texture and aroma, but is distinctly robust and buttery. This pale ivory original was brought to life in upstate New York in the late 1800s as a stand-in for the traditional, smelly cheese from Germany called Bismarck Schlosskase that German immigrants missed dearly. In 1926, Liederkranz® packed its New York bags for Ohio, before eventually finding a home in Wisconsin. We’re ecstatic Liederkranz® found a home in our fair state, and we proudly sing (or yodel!) its praises. Foil-wrapped semi-soft Liederkranz® is smooth and creamy, so it’s easier to slice when chilled, but like other wash-lined cheeses it tastes best at room temperature. If you''re storing Liederkranz®, we recommend a tightly-lidded container to contain the aroma. Your refrigerator will thank you. When we’re hungry for Liederkranz®, we want a drink with a similar been-around-the-block maturity. Beers that go well with this strong cheese include Belgian ales, saison ale, bock, brown ale, lower-hopped IPAs and cider. Wines that we like to drink with it include cabernet sauvignon, beaujolais, merlot and many German kissing cousins like riesling. 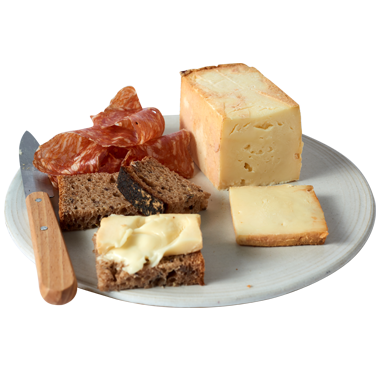 Everything that you love to do with limburger, please do with Liederkranz®. It’s a stinky force of nature with a creamy texture, so it likes to be paired with other classic Old World foods like dark breads, spicy pub mustards, crisp and assertive apples and sturdy green-based salads. We also love Liederkranz® thickly sliced with a sweet country ham on a sandwich or featured on a cheese board.